Will you let them take your guns ? Here is the record. It speaks for itself. 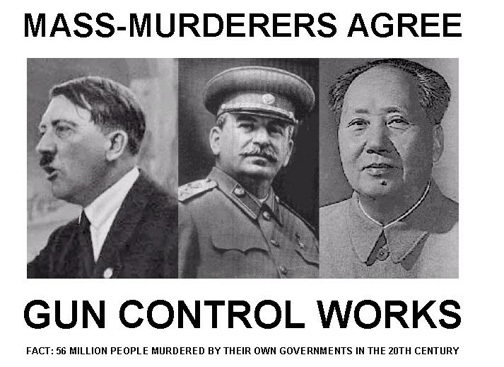 *Soviet Union established gun control in 1929. From 1929 to 1953, 20 million political dissidents, unable to defend themselves, were rounded up and exterminated. *Turkey established gun control in 1911. From 1915 to 1917 1.5 million Armenians, unable to defend themselves, were rounded up and exterminated. *China established gun control in 1935. From 1948 to 1976 20 million Anti-Communists, Christians, political dissidents and pro-reform groups, unable to defend themselves, were rounded up and exterminated. *Germany established gun control in 1938. From 1939 to 1945 13 million Jews, Gypsies, mentally ill people and other "mongrelized peoples," unable to defend themselves, were rounded up and exterminated. *Guatemala established gun control in 1964. From 1964 to 1981 100,000 Mayan Indians, unable to defend themselves, were rounded up and exterminated. *Uganda established gun control in 1970. From 1971 to 1979 300,000 Christians, unable to defend themselves, were rounded up and exterminated. *Cambodia established gun control in 1956. From 1975 to 1977 1 million "educated people," unable to defend themselves, were rounded up and executed. *United States IS establishing gun control. 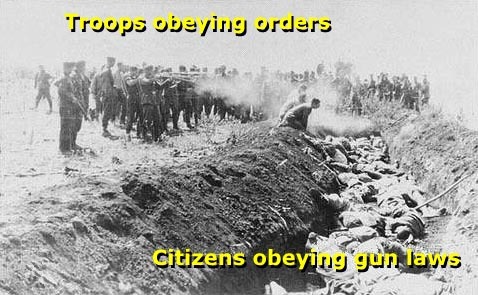 List not complete: Waco Ruby Ridge California & Missouri mandatory registration or confiscation of "assault weapons" If you were adding them up, that amounts to more than 55 million innocent people who were slaughtered by their own governments - governments that had first rendered their citizens defenseless by restricting or confiscating their firearms. Freedom-loving people are at far more risk from their own government than from all the Ted Bundys and Al Capones of the world combined! A free man with a firearm has a fighting chance against any would-be gangster or criminal. On the other hand, an unarmed man has no chance at all against an oppressive, tyrannical government.